So remember, if someone you love starts wearing black, they're probably cooking meth. 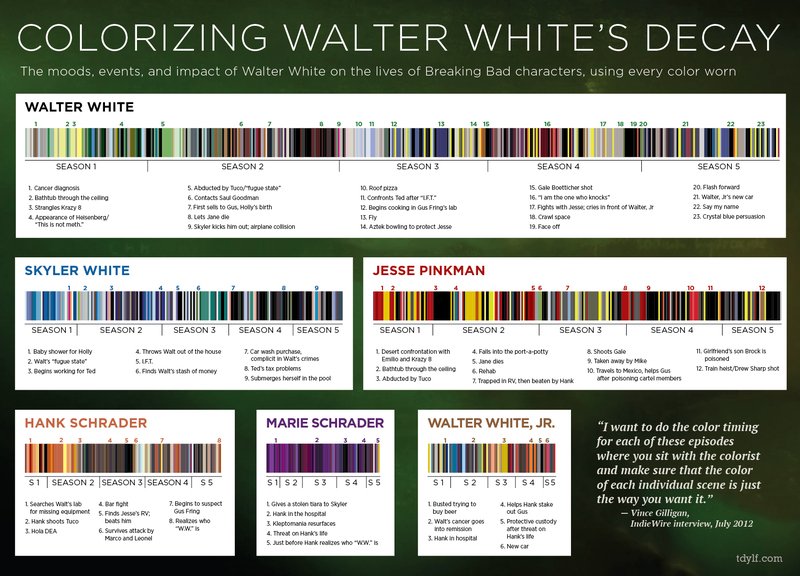 Graphic designer John LaRue has created an infographic that shows the colours worn by all the major characters over the first five seasons of cult AMC show "Breaking Bad". Colorizing Walter White's Decay gives away a lot more about the characters' moods than you might expect. Walt, for example, wears increasingly darker colours over the first two seasons, before moving on to more bold (or dare we say, confident?) colours. While Skylar's descent into her husband's world is more than evident when you look at how her colours have evolved over time. You can see the full-size version of the graphic by visiting tdylf.com.